In this game we find our hero, as usual, fighting Eggman off and defeating him...but something has gone terribly wrong. 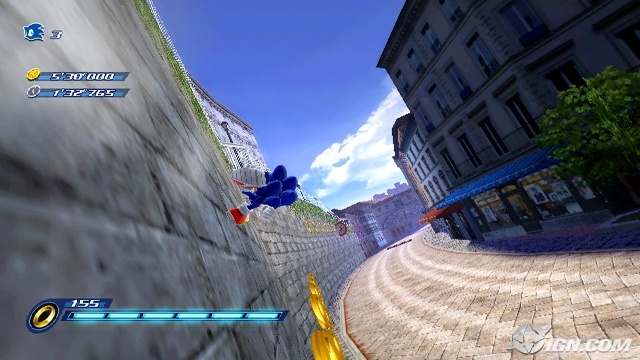 Sonic is lured into a trap, the power of the emeralds he has and his Super Sonic powers being sucked from him, while he slowly turns onto Werehog Sonic, which takes effect only during the night. At the same time, the planet is hit with a Eggman laser and a dark entity none as Dark Gaia, erupts from a split-into-pieces planet as a result of the laser fired. "You've really gone and done it this time Eggman..."
This game is a combination of Day and Night stages. Day stages are fast paced while night stages are explorative fighting stages. In both stages, you must scour the level for for items to unlock for bonus content you can see later. Day stages are always better then night stages in my opinion, but night stages are slower and easier to keep up with. Although, the PS3, Wii, and Xbox version are better. There are many characters you meet in this adventure, while having a side kick with no memory after Sonic falling on him, called Chip, that stays with you the whole game. Some of the characters are old favorites, like Tails and Amy, while there are new ones like professor pickle and such. I dislike the fact that you don't get to walk around on the streets like you can in the later versions, but other then that, there is nothing that dislikable bet everyone has their favorites. There are also plenty of mini-puzzles you can play after meeting certain requirements, which unlock more levels and bonus features. Epic boss battles and and Day and Night stages with plenty of secrets to find make an good game. Sonic being the main character, even better. I give this game a 8 rating. add a image please also you give almost all games 9.5 ratings anyway I'd give it 7 solid. RetroBowser wrote: add a image please also you give almost all games 9.5 ratings anyway I'd give it 7 solid. This game has it's flaws, so it can't be a 10, But it can come close. 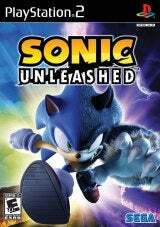 I'd give Unleashed a 7, but 9.5... WTF? I changed the rating, it didn't diserve a 9.5. Also, how do you add a picture? You see the bbc codes the text size and color 5 row 2nd one is insert image click it find a link to the image not the entire thing and put it in and it will do it for you. The review is decent the game is decent nice work sir. But try to be a little more harsh with the scores. Because not every game can be a 9 or 8 there are some bad ones. Lucaren wrote: The review is decent the game is decent nice work sir. Okay just plan it out before scoring it. maybe re read the review.